Burlap, lace, and a pair of cowboy boots: a perfect rustic barn wedding has a little bit of elegance, a little bit of shimmer, and a whole lot of country charm. When Chana and Travis got engaged, they put their guests first in their planning. "The only thing we knew we wanted was for our guests to have fun," says bride Chana of their wedding day vision. "We are both always laughing and having a good time, and on our perfect day we wanted our guests to feel the same thing." To accomplish that, a laid back venue with a welcoming atmosphere was crucial. The couple chose Forevermore Farm in Moore, South Carolina, just outside of Spartanburg, for both their ceremony and reception. "As we started to look for a venue, we wanted something that was simple but gorgeous. We came across our venue at a friend's wedding. We went back to take a look by ourselves and we knew that it was the perfect place. It was a gorgeous barn with a beautiful view of the outdoors. There was nothing at the venue we didn't like," remembers Chana. The Upstate wedding venue and their carefully selected vendors (including Jill Brisken of Lainey Bug Photography) turned a beautiful sunny day into a wedding event that this couple and their guests will never forget. "I think everyone who came could agree that they accomplished their dream of it being a very fun wedding full of laughs and good times for sure!" states photographer Jill Brisken. After being introduced by a mutual friend at a racetrack in 2014, Travis and Chana quickly became inseparable. Almost two years later, the couple took a trip to Helen, Georgia, to celebrate the Fourth of July, Chana's favorite holiday. Travis jumped at the chance to propose on a day that already meant so much to Chana, and he popped the question as they watched the fireworks that evening. In most of the first looks that we showcase, it's typically the bride surprising her groom with her full wedding day look. But that's not to say that brides can't stage a first look with their parents or bridesmaids for an equally fantastic reaction. Chana decided to surprise her cousin Nolan with a first look on the day of her wedding since the two share a special bond. "Nolan is my cousin but he's more like a brother," says Chana. "He wanted to see me first before anyone else so we had a first look and got to share that special moment." At the forefront of Travis and Chana's mind on the day of their wedding was Travis' daughter, Kayleigh. Both wanted to make sure that she felt included and loved as the couple pledged to create a new family together. "We felt like it was important to incorporate Kayleigh, so we poured paint on to a canvas together during the unity ceremony," remembers Chana. Watching their family come together during the ceremony was touching to everyone involved. 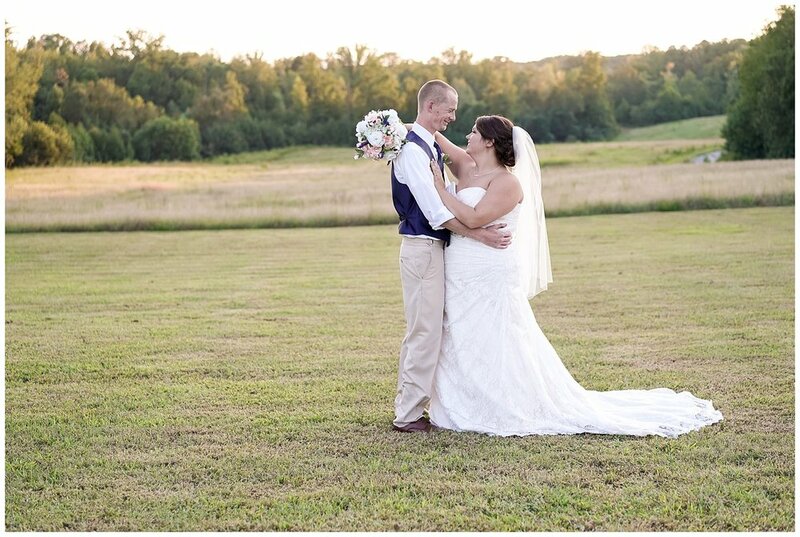 Says bride Chana, "Travis' favorite part was when he saw Kayleigh, his little girl and me, his soon to be wife, walk down the aisle to join him at the alter as well." As a photographer, space to shoot and plenty of background options are crucial. 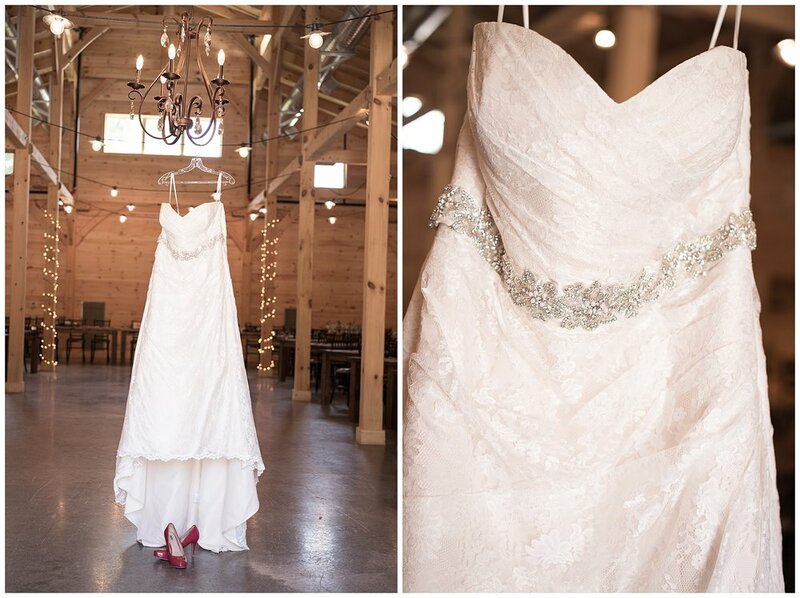 Jill Brisken was delighted to experience the different facets of Forevermore Farm for Chana and Travis' wedding. 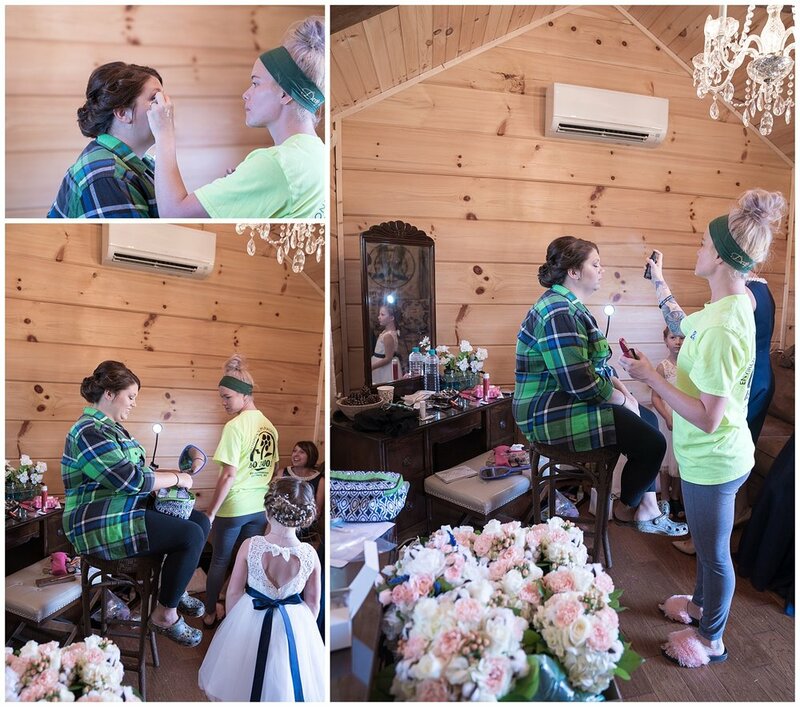 "When I arrived, I met the bride and her bridesmaids in the separate Bridal Cabin behind the Stables. This was a perfect area for the girls to get ready! The groom and groomsmen also had a room inside the main Stables that was set apart for them to get ready in, complete with a pool table." 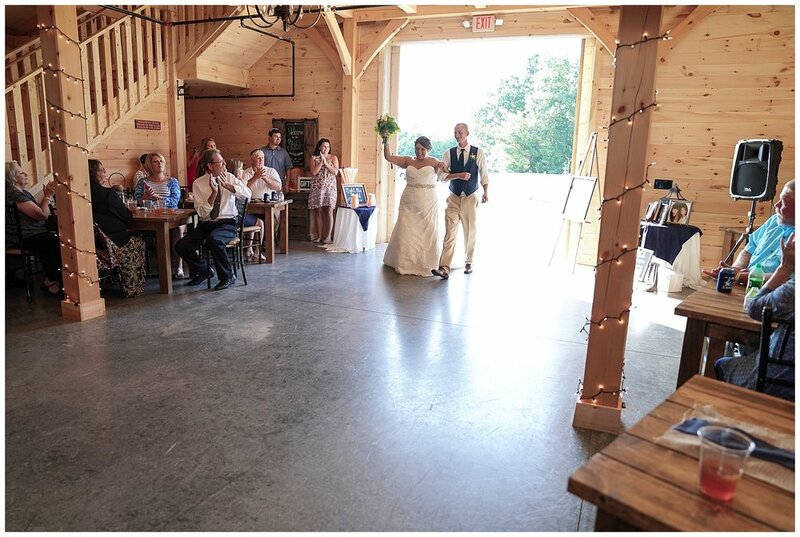 The ceremony was held outside on a beautiful September day, and the wedding moved inside the barn for the reception. The event utilized the wide main area for dancing and seating with easy access to the buffet and drinks station. For a great twist on a tradition, the couple headed upstairs to the loft, which has a half wall perfect for an exciting bouquet and garter toss. The send off for Chana and Travis was inventive and lots of fun. Remembers photographer Jill Brisken, "the couple enjoyed visiting and dancing with their friends throughout the rest of the night, until they had a fun “Light the Night” exit with glow wands!